Here’s a history lesson. On April 14, 1969, an American laid claim to Canadian territory for the first time since the War of 1812. The American was Montreal Expos left fielder Mack Jones. The territory was the left-field bleachers at Jarry Park, which was renamed Jonesville after his three-run homer and two-run triple helped the Expos win their first-ever home opener. Jones was happily acclaimed Mayor-for-Life. Warm and sunny spring weather greeted the Expos and the reigning National League champion St. Louis Cardinals that day for the first regular-season major-league baseball game ever played outside the United States. Preparations for the opener continued right up to game time, including staff — Expos general manager Jim Fanning among them — unfolding 6,000 chairs to serve as temporary seats. More than 29,000 fans (not counting people watching the game standing on snow drifts outside the stadium) and 200 members of the media from the United States and Canada filled the Expos’ ballpark to watch the home club take a huge lead, blow it in one atrocious inning, then rebound to win it and send the fans home happy. Nelson Briles started for the Cardinals, while veteran Larry Jaster took the mound for the Expos. Curt Flood hit a double in an otherwise perfect first inning for Jaster. Briles wasn’t so fortunate. Leadoff hitter Don Bosch led off with a single to right. After Maury Wills forced Bosch at second for the first out, Briles walked Rusty Staub, then gave up Jones’s home run to straightaway center field to give the Expos a 3-0 lead. 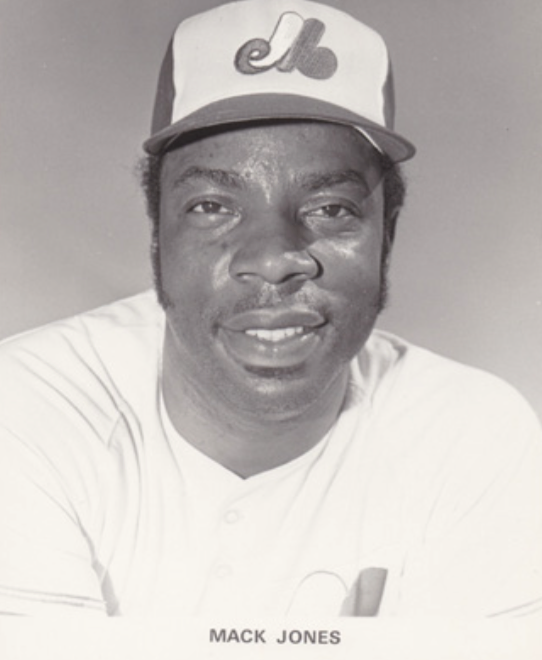 Mayor Jones increased the Expos’ lead in the bottom of the second, tripling home Wills and Staub, who had both singled, putting the Expos up 5-0. A hero was born. The third inning went better for Briles as he gave up only one run. Coco Laboy walked and advanced to second on a groundout by Gary Sutherland. Jaster singled to score Laboy, giving Montreal a 6-0 lead and causing delirious Expos fans to inquire about World Series tickets. Then came the top of the fourth, an inning in which the Expos committed five errors and saw their 6-0 lead turn into a 7-6 deficit. Expos catcher John Bateman proved a generous host by dropping Mike Shannon’s foul popup, keeping his at-bat alive long enough to allow him to reach first when his groundball went through shortstop Wills’ legs. Tim McCarver then singled, followed by Julian Javier reaching first when first baseman Bob Bailey booted yet another grounder. At this juncture, one of the peculiarities of Jarry Park should be pointed out. The songwriting team of Ian and Sylvia may have been thinking of the stadium when they wrote their hit “Four Strong Winds,” because all four of the breezes congregated there and blew consistently from left to right. More than one popup to second ended up going over the right-field fence for a home run. That’s the only logical explanation for what happened next, when number-eight hitter Dal Maxvill, who had three career home runs in seven major-league seasons, smacked a grand slam to right center. Jaster got the next two hitters out, and then gave up a single to Curt Flood. After moving to second on a balk, Flood scored on a single by Vada Pinson. Pinson himself arrived at second when his hit got by center fielder Bosch. Jaster’s disaster of an inning continued when the next batter, Joe Torre, belted a two-run shot to give the Cardinals a 7-6 lead. As much out of mercy as anything else, Expos manager Gene Mauch replaced Jaster with Dan McGinn. The Cardinals had batted around, so Shannon came to the plate for the second time in the inning. And for the second time in the inning, he hit a foul popup that an Expos infielder dropped, except this time it was Bailey. Shannon wasn’t able to take advantage of his second chance this time, as he popped up to short to end the carnage. Of the seven runs the Cardinals scored, only two were earned. After playing more like Larry, Curly, and Moe than Tinker, Evers, and Chance in the top of the fourth, the least the Expos could do was make sure that Jaster wouldn’t get saddled with a loss, so they scored one in the bottom of the inning to tie the score 7-7. Wills singled, then moved to third on a double by Rusty Staub. That was enough for Cardinals manager Red Schoendienst, who replaced Briles with Gary Waslewski. Waslewski walked Jones intentionally, then uncorked a wild pitch with Bailey at the plate, allowing Wills to score. With both starters gone, the next two innings were uneventful. In the bottom of the seventh Dan McGinn the pitcher became Dangerous Dan the clutch hitter, when he singled home Coco Laboy, who had doubled, for what turned out to be the winning run. McGinn went the rest of the way, giving up no runs on three hits over 5⅓ innings to win the first-ever major-league game outside the US. Expos fans didn’t care what Flood thought of the field. After a nine-year absence, when the historic Montreal Royals left town in 1960, baseball was back in town. And it was major-league baseball to boot. Lines started forming at the ticket booths as soon as the game was over. A love affair had begun. This article appeared in “Au jeu/Play Ball: The 50 Greatest Games in the History of the Montreal Expos” (SABR, 2016), edited by Norm King. To read more articles from this book, click here. Daily Capital News (Jefferson City, Missouri). Les Expos Nos Amours (video). 1 Ted Blackman, “Big league ball fever has Expos’ fans in a dither,” The Gazette (Montreal), April 15, 1969. 2 Video, Les Expos Nos Amours, produced for TV Labatt, copyright 1989. 3 Gary Waslewski, telephone interview, September 10, 2014. 5 “Flood Blasts Expos’ Park,” Daily Capital News (Jefferson City, Missouri), April 15, 1969.